The MGA Insurance Function Centre offers a an exceptional setting for your next function. From corporate conferences / seminars to the most intimate of weddings, our facilites have all that you require to make your function a success. What have you decided for your Staff Christmas Function this year ... why not book the function centre on a race day with a fully catered food & beverage package. Looking for somewhere to hold your 'End of Footy Season' show, school / club / family reunion, Birthday Bash, Fundraising Evening.... you'll find us pleasingly competitive with personalised service. We are able to offer special rates to Charity and Community Groups and are always more that happy to negotiate a rate to suit your budget. Please click here to make an enquiry. 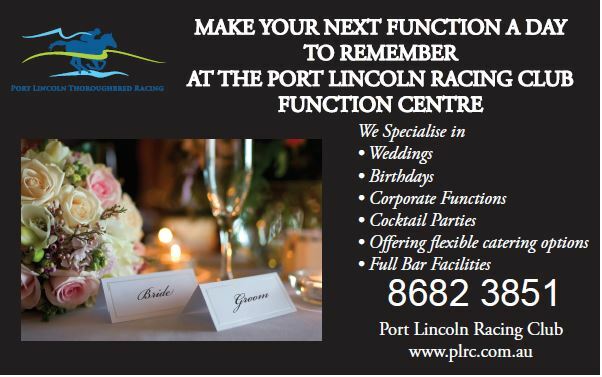 Port Lincoln Racing Club support the LBGTIQ Community. Why not book a time to look through our outstanding venue and see for yourself. Our Function Centre Coordinator will be only too happy to give you a tour.